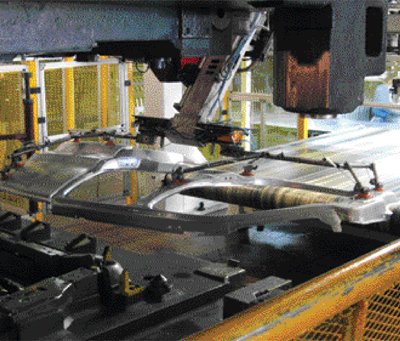 Magna operates automotive stamping and assembly plants all over the world. And, manufacturers of metalforming and automation equipment are hard at work developing the products needed to support the company’s global expansion efforts. This often requires the coming together of vastly different cultures, whether Eastern or Western European, American, Canadian, Mexican or Asian. The successful integration of new, complex automation products into a pressroom requires close cooperation of all parties involved—the equipment provider, installer and the customer, regardless of their nationalities and individual business cultures. 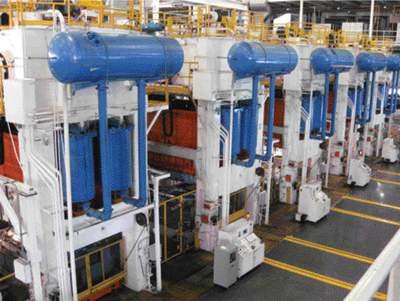 This five-press line at Estampados Magna de Mexico produces Class A automotive panels. Originally set up as a tandem line, it now runs more like a transfer line—more quickly and smoothly than ever before—thanks to new automation added to the line earlier this year. One recent case illustrates this point well: integration of new transfer automation by Swiss manufacturer Gudel at one of the newer Magna automotive-stamping and assembly plants in Mexico. The installation and five-month ramp-up earlier this year of Gudel’s roboFeeder transfer units have dramatically improved process flow along a five-press tandem line at the Estampados Magna de Mexico plant in Ramos Arizpe, Coahuila, Mexico. Swiss, American and Mexican engineers worked hand in hand with Magna personnel from Mexico, Canada and the United States to ensure that the line upgrade yielded the expected productivity gains. “We’ve doubled output from the line,” says plant general manager Roman De La Torre, “in part because our line operator can troubleshoot the entire line in less than 3 min. working from one control console.” Originally, according to De La Torre, the operator had to walk the entire five-press line and survey four different control consoles to troubleshoot. This could cause the line to be down for as long as 15 min. “The significant improvement in the trouble-shooting process came about thanks to the close cooperation of all parties involved in upgrading the tandem line,” he says. The Estampados Magna de Mexico plant in Ramos Arizpe, acquired by Magna in 2004, provides Class A stampings and assemblies primarily to the nearby General Motors assembly facility (for the Vue and HHR vehicles), as well as to neighboring Chrysler and Nissan plants. Its 360,000-sq.-ft. plant houses 38 presses from 150 to 1500 tons, including a pair of huge tandem lines, each with five 1500-ton mechanical presses. A 180-in. tandem line stamps primarily one-piece body sides, as well as hoods, doors and floor pans. It is this massive line that Magna chose to upgrade with new transfer units. Among the products formed along the newly automated tandem line are one-piece body sides, shown here, as well as hoods, doors and floor pans. De La Torre runs 12 different die sets through the 180-in. line, in lot sizes of 600 to 720. “We run about 1.5 days worth of stampings for our customers, who require 420 to 460 parts per day,” he says. The line runs six die sets to stamp six different one-piece body sides for three car models, and two die sets each to stamp hoods, doors and floor pans. Blank width ranges from 2 to 3.6 m; the plant cuts all of its blanks, using three blanking lines. Added benefits of the new transfer equipment include reduced setup time to change the tandem line over for a new job, as well as reduced maintenance costs. With the two-axis transfer equipment, the entire line comprised 14 pieces of equipment, including a loader and unloader for each press. Now five roboFeeder units and a blank loader at the front of the line keep the entire line fed with parts—that’s a lot fewer tool changes, and a lot less equipment to maintain. De La Torre says that the plant changes out the line in as little as 12 min., stationing two operators at each press to change dies. He plans to install automatic die clamps on the presses soon, to help reduce die-change time to less than 10 min.